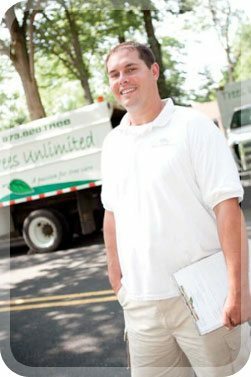 When Justin Shaw launched Trees Unlimited, LLC, in 2005, Wall Street’s loss became the environment’s gain. In starting a tree service business, Shaw left the world of high finance to move closer to his true calling, echoed by the company’s slogan: “A passion for tree care.” Trees Unlimited is equal parts environmental protector and exterior designer. With both residential and commercial clients in Essex, Passaic, Morris and Bergen counties, the company works alongside builders and landscapers to provide services such as pruning, removal and other tree care. Trees Unlimited often remedies homeowners’ issues, such as increasing the amount of sunlight a home receives, or eliminating the threat of a sick tree falling on the house. The company treats ailing trees, cares for healthy ones and—only rarely—removes them. Other work involves incorporating trees into landscaping upgrades, such as pool additions. Shaw’s fascination with trees began during high school, when he worked for a tree service company. He later turned down a football scholarship, and earned his bachelor’s in urban tree management. After three years of working for a tree company, however, he returned to school—this time to satisfy his curiosity about the financial world. Degrees in finance and economics in hand, he landed a job with a wealth management team. But for Shaw, the green of finance couldn’t compete with the green of trees. So bidding Wall Street goodbye, he launched Trees Unlimited, LLC. The company uses trees to improve the allure—and value— of both home and business properties. Shaw begins by surveying what the customer wants to achieve, and then figuring out how trees fi t into the plan. Removing a tree is always a last resort, no matter how challenging the work to preserve it. “We explain that removing a tree is not only costly, but also reduces property value,” says Shaw, who estimates that keeping trees can, in some cases, boost that value by as much as 25 percent. It’s doubtful you’ll find anyone with more of a passion for tree care than Justin Shaw. To him, removing a tree is always the very last resort no matter how difficult and challenging the effort to preserve it. Though he has degrees in finance and economics, Justin decided to follow his passion and with an additional degree in urban tree management, launched Trees Unlimited, LLC in Wayne, NJ. Justin is also a Certified Arborist and Certified Tree Safety Professional.